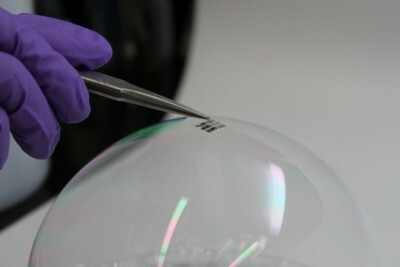 We fabricate the thinnest (1.3 μm) and lightest (3.6 g/m2) solar cells yet demonstrated, with weight-specific power exceeding 6 W/g, in order to illustrate the lower limits of substrate thickness and materials use achievable with a new processing paradigm. Our fabrication process uniquely starts with growth of an ultra-thin flexible polymer substrate in vacuum, followed by deposition of electrodes and photoactive layers in situ. 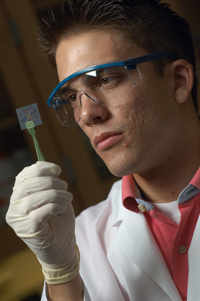 With this process sequence, the entire cell—from transparent substrate to active layers to encapsulation—can be fabricated at room temperature without solvents and without breaking vacuum, avoiding exposure to dust and other contaminants, and minimizing damage risk associated with handling of thin substrates. We use in situ vapor-phase growth of smooth, transparent, and flexible parylene-C films to produce ultra-thin, lightweight molecular organic solar cells as thin as 2.3 μm including encapsulation with a second parylene-C film. These parylene-based devices exhibit power conversion efficiencies and fabrication yields comparable to glass-based cells. Flexible solar cells on parylene membranes can be seamlessly adhered to a variety of solid surfaces to provide additive solar power.